For #winePW 5 “Fall Fruits and Wine Pairings,” I decided to go with some favorite fall flavors—the flavors of apples, pears, cinnamon, pecans, and maple syrup. I can’t think of a better way to spend part of the weekend but to sip some cool wine while eating a warming fruit crisp. Whisk first 4 ingredients in medium bowl. Add butter. Working quickly so butter does not soften, rub in with fingertips until moist clumps form. Stir in oats, pecans, and maple syrup. Chill while preparing filling. Can be made 1 day ahead. Cover and keep chilled. Preheat oven to 350°F. Whisk first five ingredients in large bowl. Add pears and apples; toss. Transfer to 13 x 9 inch baking dish. Sprinkle topping over fruit mixture. Bake until topping is crisp and golden brown and juices are bubbling, about 50 minutes. Serve warm with cinnamon whipped cream. In a large bowl of a stand mixer, beat the cream, sugar, cinnamon, and vanilla until stiff peaks form. Do not overbeat. The hints of apricot and pear were delicious with this maple-flavored dish. Wine Pairing Weekend # 5 Bloggers: Be sure to check out what my fellow bloggers have come up with for the October Wine Pairing Weekend! Join the #winePW conversation: Follow the #winePW conversation on Twitter throughout the weekend and beyond. If you’re reading this early enough, you can join us for a live Twitter chat on our theme “Fall Fruits + Wine” on Saturday, October 11, from 11 a.m. to noon Eastern Time. You can also visit our group Pinterest board to pin some great pairing ideas for later! Stay tuned for the November Wine Pairing Weekend, which will be on Saturday, November 8. Yummo!! 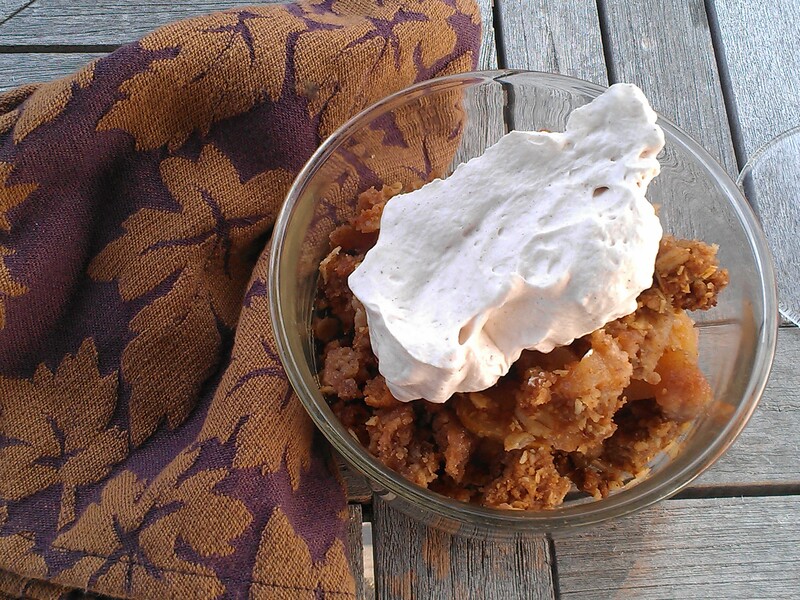 Rieslings always seem to pair nicely with fruity desserts. They do, don’t they? This was pretty much a no-brainer pairing. Loved your apple upside down cake. I would love a piece right now with my tea. 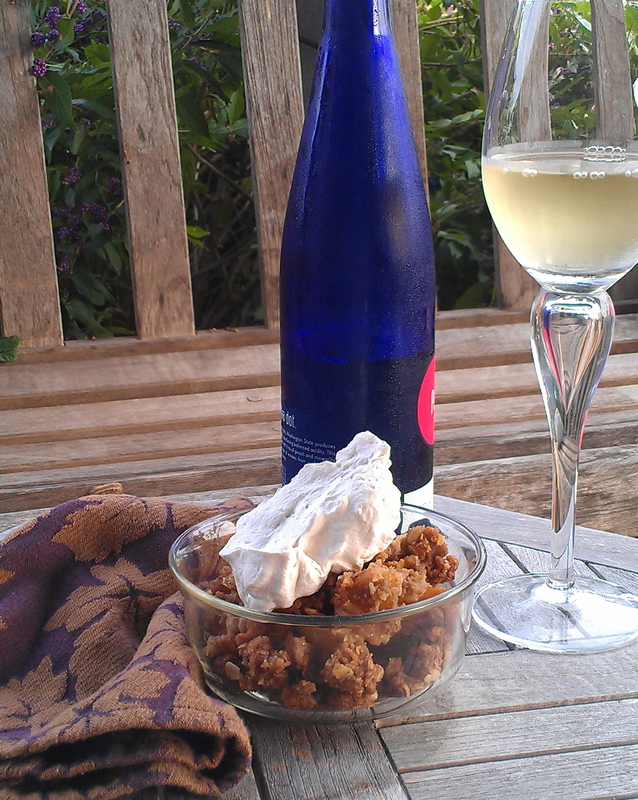 I used to buy certain wines just for the labels ;-))) A crisp refreshing Riesling is great paired with desserts. Yep, I have been known to do that as well—especially for “fun” gifts for good friends (who can take a joke). You had me at ‘pear’, then you added ‘ginger’ and a Riesling. Nice pairing. Thanks for cooking – and sipping – with #winePW. Yes, I am going to try this recipe (from the “inspired by” original recipe) soon because I love the ginger. Ha! Yes…the Krug Grand Cuvee would have been nice! But actually, I bet the Riesling worked better. Great looking dessert. Yes, if I had the extra cash laying around, the cuvee would have been marvelous. Sadly (I guess), I will be abstaining from wine and all alcohol for about 3 long months. A medication prevents me from imbibing for a bit but I am sure enjoying the wine right now!! Crisps are always delicious, especially when paired with wine. Looks like a tasty combo. Cheers! G’day! what a great post! Great recipes and pairings! Cinnamon is my eternal love! And apples and pears and maple…. Oh how delicious Debra! I’m imagining the wonderful aroma and fabulous fall flavors! It did smell great and I would even amp up the maple next time. What a perfect pair! Your crisp looks delicious! Thanks, Sarah. This was a fun post. 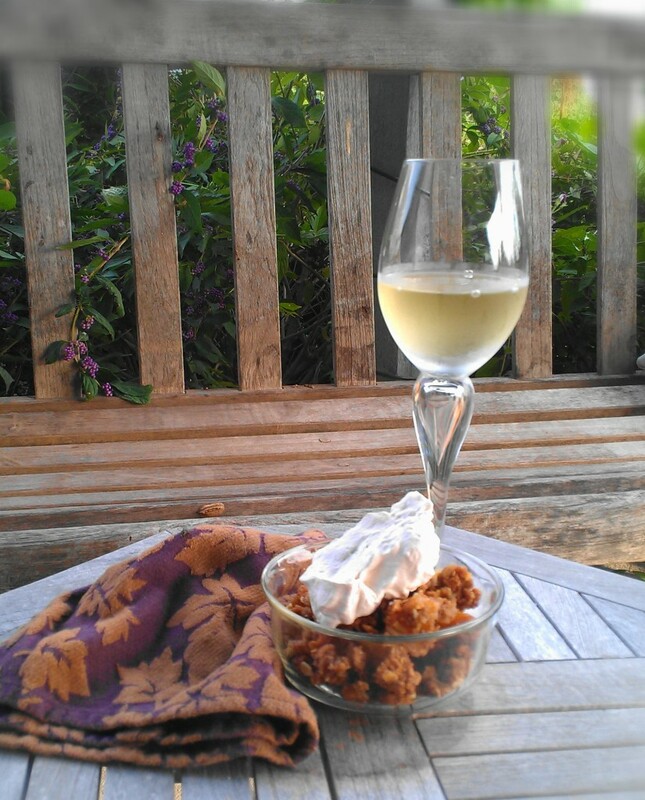 I’ve always had a hard time pairing a wine with a dessert, but it looks like you have a winner here. I think rieslings go with a lot of desserts. Thanks, Kate. I finally got connected and will respond back. My goodness! I love maple anything and you have really outdone yourself on this one. The photo is gorgeous and the maple crisp looks as though it would melt in your mouth! Thank you very kindly, Kelli. Now that is one purely perfect pairing!! You simply can’t go wrong with apples, pears, cinnamon, pecans, and maple. Thanks, Kim. It is a must make again dish. As I said cinnamon is my favorite spice! Thanks for coming and linking up at The Weekend Social. It is warm and comforting.